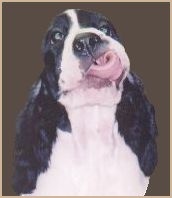 At Nanjay we take a holistic approach to dog nutrition and feed only the finest quality dog food to our Springers. Our puppies eat Solid Gold Hund-N-Flocken Puppy Food and our adults eat Solid Gold Hund-N-Flocken Adult Dog Food. Even our Ragdoll cat eats Solid Gold -- cat food. We also use, and sell to our many happy clients, the full line of Solid Gold products, including Sea Meal supplement, treats, biscuits, shampoos, conditioners, and more. Nutrition plays a vital role in a dog's over-all health. Solid Gold products are non-allergenic, boost the immune system and protect against disease. Our dogs have luxurious, shiny coats, healthy skin, eyes and ears, a zest for life with lots of energy and over all great health. How does Solid Gold foods differ from other brands? The grains we use in our food are USDA Grade I and II Millet, Barley, Amaranth and Brown Rice. All the grains used in our food are guaranteed free of Aflatoxin and are purchased with a guarantee that they are free from pesticides and herbicides. Wheat, corn and soy are the main causes of food allergies in pets. We do not use these grains in our foods as they may cause itching, hair loss, irritation, chewing at the feet and biting at the base of the tail." One way to assure that a dog is receiving all of the nutritional benefits possible is to feed him a holistic or natural diet. The word "natural" is often interpreted in many different ways. It is a very popular word when referring to both human and pet nutrition. The word natural is synonymous with words like healthy and organic. It might mean that the product contains no dyes or chemicals. Quality dog foods should provide the pet with six basic nutrients necessary to sustain good health. These nutrients include protein, fats, carbohydrates, vitamins, minerals and water. 100% of all the dog's needs should come from its dog food with the exception of water, which needs to be supplemented daily. The new holistic approach to dog nutrition takes an additional step toward optimum nutrition by including naturally beneficial ingredients. Proteins, fats and carbohydrates provide energy for the pet. Dogs are continually expending energy and this energy expenditure increases during lactation, exercise, and when regulating body temperature. If the dog spends a lot of time outdoors or is typically active, he will require more protein, fats and carbohydrates for energy production than a sedentary dog. Vitamins and minerals like calcium, vitamin A, D, and E are also important to a dog's overall nutrition as they are involved in virtually every bodily function. Vitamins and minerals are key elements in providing beneficial antioxidants, protecting cells from free radical damage, enhancing the immune system, and promoting bone development and strengthening of surrounding ligaments. Unaware of the importance of these nutrients, many dog owners believe that all dog foods are about the same and that the difference in cost can be attributed to expensive packaging or increased marketing costs. But all dog foods are not created equal. Many dog foods are produced as cheaply as possible by using poor quality meats and high amounts of poorly digested carbohydrates. Sugars, artificial colorings, artificial flavorings, and chemical preservatives are often added to these products to improve the taste or appearance of the product. Poor quality dog food can create a number of unpleasant ailments, including excess gas, increased bowel movements, diarrhea, itchy, bumpy skin, dull hair coats, brittle nails, and vomiting. Solid Gold always uses wholesome USDA Choice lamb and beef meal, USDA grade I and II grains, and healthful monounsaturated and polyunsaturated oils. Solid Gold never uses chemical preservatives such as BHA, BHT and Ethoxyquin, which may be related to some diseases in pets. Solid Gold never uses wheat, corn or soy, which are often genetically modified and common allergens for dogs, causing them to have uncomfortable skin disorders, chew incessantly at their feet or suffer from chronic problems such as ear infections. Solid Gold never adds animal or poultry fat to their products, as these are saturated fats that may contribute to heart disease and certain types of cancer. Solid Gold is also an industry leader in the use of revolutionary foil "barrier" packaging for all their dry food products, which means they don't have to use chemical preservatives or flavor enhancers. Barrier packaging keeps food fresher for longer, maintains palatability and helps to sustain the potency of valuable vitamins and other nutrients, which may deplete over time with conventional paper bags. **MEAT VERSUS MEAL- Solid Gold uses USDA, hormone-free, New Zealand lamb meat and Menhaden Herring fish meat in our dog and cat food formulas. To prevent the USDA from adding ethoxyquin to our meat we dehydrate it and take out all animal fat. According to the AAFCO, because it is dehydrated, we must label it meal instead of meat.